Horombo huts, view from the higher parts of the campsite next to the huts at dawn. An accommodation camp along the Marangu route of mt. 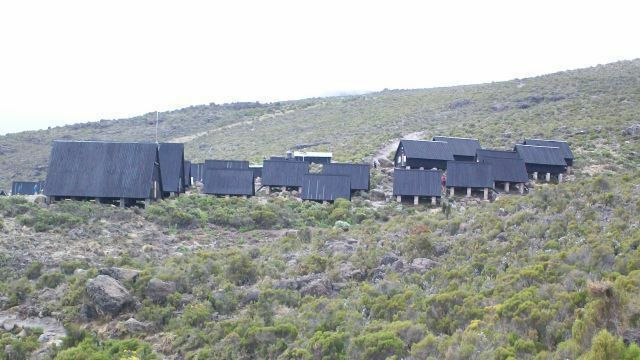 Kilimanjaro — one of the largest on the mountain, with both cabin accommodation and a separate area for pitching tents. It is the second campsite from the start of the route or Marangu gate, and is normally used by hikers on the Marangu route during both ascent and descent. It is also used by descending climbers on the Rongai route. There is a good supply of water at Horombo huts from a nearby stream, thus making it one of the few camps on the mountain with W.Cs and bathroom wash sinks. Its cabins are wooden A shaped huts that are capable of housing 6 to 8 people each and although no self contained rooms are available, the cabins are capable of holding up to 120 climbers. 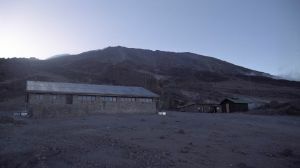 Other facilities at the campsite include a ranger's hut/office, a mess hall and separate housing for the porters and guides. Horombo huts campsite sits in the south eastern part of mount Kilmanjaro, atop one of Mawenzi's ridges. This is near the edge of the moorland region of the mountain and start of the alpine desert. Any wet clothes would have a hard time drying here due to the high humidity and rainfall. The ground and rocks in the area are slippery most of the time. 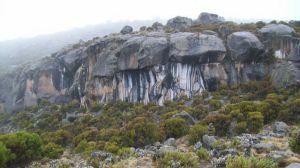 Nearby are the Zebra rocks, usually visited as an acclimatization trek for those on the Marangu route. Most people would start to experience altitude sickness at this campsite — a good reason for an acclimatization trek. The campsite's location on sloping ground, shields it from the high winds that are normally present at this altitude. The previous campsite from this is Mandara huts whereas the next is Kibo huts. Are you associated with Horombo Huts campsite? Contact us to improve this page or create another page for your business.